We can only write what we know. Knowing this, writing research reports is asking a lot of young writers. Report writing involves reading, viewing, or listening to new information, understanding it and then writing about it in a way to teach others. That’s way up there on the cognitive processing charts. And that’s what my kiddos are attempting on the topic of water. It’s an issue that interested them and seemed simple and relatively accessible. We have lots of books and videos on it. So we went for it. Students had researched. Taken notes. Studied mentor text. Noticed structure. They knew how they wanted their writing to go. Many were pushing to write, enough with this research! This weekend, I tried to write my report and struggled with the task. How well did I understand it? How should I put it together? And most importantly, what is the next step for students? Monday came. I shared my process. I set my introduction aside, and I chose the section I was most passionate about writing. The one I knew the best. As disconcerting as not starting with the beginning was for many students, they did it. They picked up the section they were excited about and started with energy. They knew how this should go, and they went for it. For a while. Then pens started to stall. This is how kids look when they get stuck. I knew why. I had experienced the same thing this weekend. Their knowledge couldn’t sustain their writing. I said, “Guys I know this is hard. It’s hard because we all aren’t experts on all of the things we want to write about. We know it, sort of. The thing is we are passionate about different things. So who would like to conduct seminars on a topic? What are you passionate about? What could you teach someone else? Hands shot up, and engagement went through the roof. A. had a group discussing bodies of water. K. taught all about the weather. D. and R. explained the water cycle. W. was sharing how water exists throughout our bodies. T. had a seminar on climate change. Groups of students huddled around their instructors with notebooks. Students got the opportunity to chart and explain and re-learn. They moved every five minutes or stayed to “re-hear” and note take. Fidgeting and needs for the bathroom disappeared. After the twenty-minute mid-workshop teach, energy and writing resumed. Those seminars were not in my plan. What should I have done to make this a better lesson? Should I have started with the seminars rather than the writing? At first glance, I thought so. But on reflection, how would I have known what students needed unless I had given them a chance to write. Sometimes we have to sit back and watch to know what’s next. 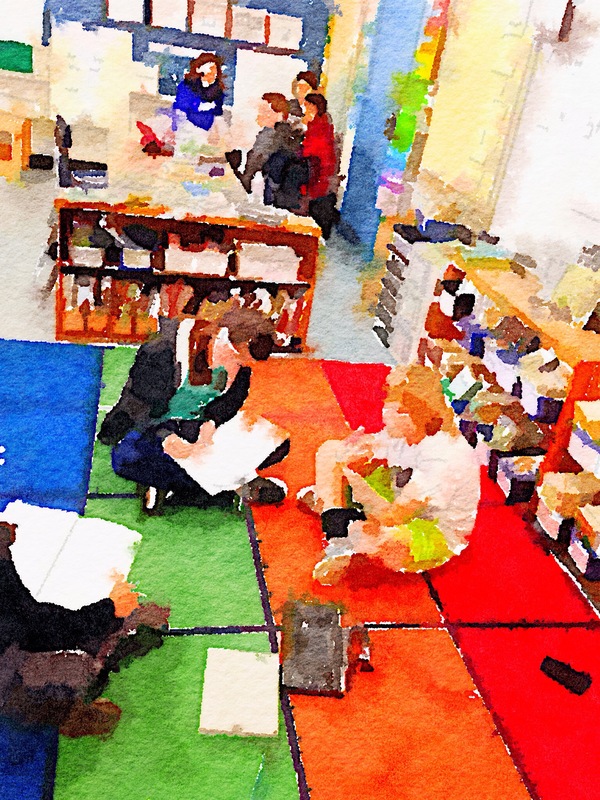 Thank you, Two Writing Teachers for this space to share our reflections on life. 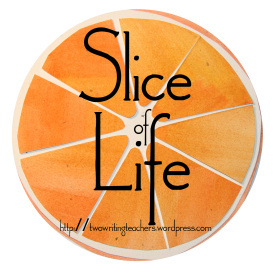 Read more slices here. Now that’s a reflective and responsive teacher! The power was with the kids, not you and that’s how learning happens. 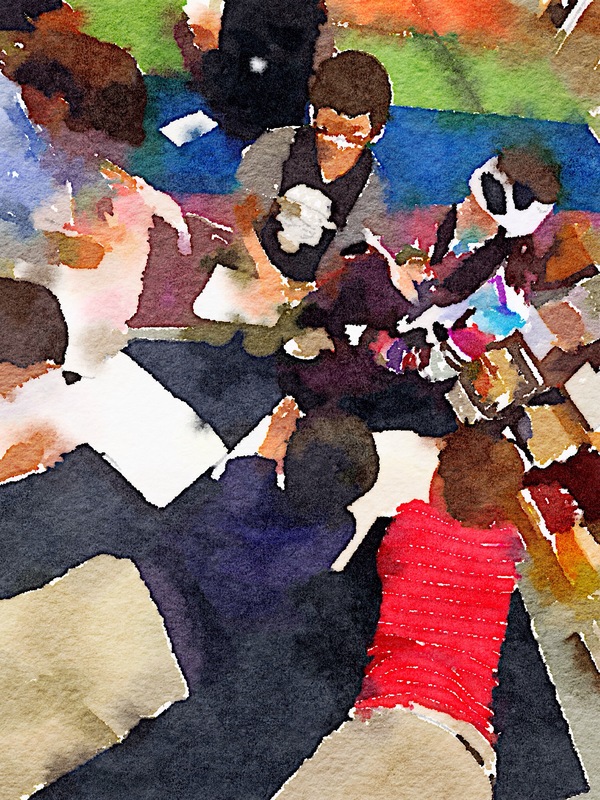 Love your waterlogue photos! This is what makes teaching an interactive, reactive process: you practiced yourself, you listened to your kids, you gave them agency in the process. Perfect! Wow. I am so inspired by this. I think this contains some valuable lessons for teachers– one, do the assignment yourself so that when students struggle, you understand why; two, be flexible so that you can meet students where they are and three, switch modes in order to restore engagement. Definitely filing these lessons away in my toolbox. Also, I love the watercolor images. How did you do that? Thanks so much Nancy. 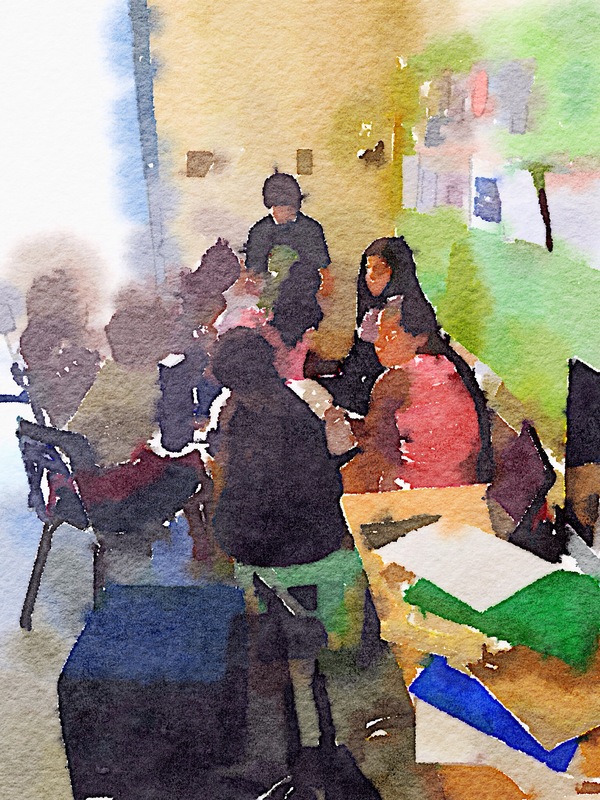 The trick with the pictures is the app Waterlogue. It costs $2.99, but is so easy and fun. It’s worth the $. Here is where you see the art of teaching! Looking, listening and moving to reach the needs of the students around you! Great lesson – thanks for sharing. Thanks, Lisa! It was so fun. The photo trick Waterlogue app. Fun and easy. Only downside $2.99. New favorite quote: Sometimes we have to sit back and watch to know what’s next. Another brilliant reflection!! I love being “a fly on the wall” as I read your posts. And now you have raised the bar by adding amazing watercolors!! You need to say more about that in the future! This is what reflective teaching is all about. I love that you tried to write the report before having the kids do it. I admire that you have so many kids and they learn from each other. Those pictures alone tell the story of engagement. Exactly! “How would I have known what students needed unless I had given them a chance to write.” Watch, listen, then maybe time to act. Love seeing the action pics! That you try it before setting your kids up to write their reports is so key. It truly gives you a genuine window into their process. What a beautiful kid workshop teach… Kids doing the work and the learning. This is the genuine facilitating and leading of learners. I meant mid-workshop teach, but maybe kid-workshop teach works just as well! I love how each of the kids are experts. I was lucky enough to attend the Duke School Project Workshop last week, and it was all about each student becoming an expert on a topic as part of a group’s topic within the overall project. During the culmination piece, each teachers or shares their learning as an expert. It’s exciting. There is so much goodness happening in your classroom, Julieanne! Your students are fortunate to have such a gifted educator teaching them this year.